We invite you to explore India - the Land with infinite beauty ! Whether you soar high into Himalayas or peer under the ruins of the Ancient monuments dotting the landscape of India, you will cherish the experience long after your visit ! This India Travel Guide on Yamunotri is free from any commercial interest! This site is dedicated to promote India - the vast subcontinent, its glorious past, magnificent landscape and its infinite variety. Yamunotri is believed to be the point of origin of the river Yamuna and the shrine here is dedicated to the goddess Yamuna. The goddess Yamuna is believed to be the sister of the god Yama, who is considered the God of Death. Pilgrims believe that a dip in the holy river here will relieve them of the agonies of death. 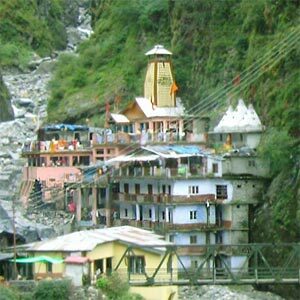 Yamunotri is also famous for its thermal springs, in which the rice used to make the prasad is cooked. Typically, the prasad in this temple is rice and potatoes. The temple at Yamunotri is located on the left bank of the Yamuna River, which originates from the Champasar Glacier. Surrounded by mountains on all sides, this holy spot is close to the Indo-China border. The statue of the Goddess is made of black marble. The Yamunotri Temple opens on Akshaya Trithiya and closes on Yama Dwitiya after Diwali. You will find special poojas on Diwali and Janmashtami. Due to heavy snowfall, the Yamunotri Temple remains closed from mid-October all through till nearly April-May. You can plan to visit Yamunotri during May-June or September- November. During the monsoon, it may be difficult to reach the temple. The Divya Shilla is the rock pillar that is traditionally worshipped before pilgrims enter the main temple. Don't miss the Shiva temple at Kharsali, a kilometer away from Yamunotri. The intricate woodwork in this temple is exquisite. If you are travelling by train, you can travel from Rishikesh or Haridwar. Road routes are available from Rishikesh, Mussoorie, Uttarkashi, Dehradun and Gangotri. Pilgrims can choose from ashrams, guesthouses and dharamshalas as accommodation. You need to trek up from Janaki Chatti which is nearly 6 kms away. Alternatively you can take a pony or be carried in a palanquin. Arm yourself with adequate warm clothing.